If you have a Trello account you could easily import your Trello notes as cards into Kanbanize. * The tags in Kanbanize do not have spaces so we add a "_" (underscore) separator if the label has two or more words. * When checklist converts to subtasks -> the Tile of the checklist is in brackets and then each item description is added. 1. Hover over the Trello panel in Administration -> Integrations -> Configure. a. Click on "Connect to Trello" - a popup appears that asks for permissions and if you are not logged in trello.com, it will prompt you to log in first. Note: Even though the popup asks for "read and write" permission, currently, we only READ the data from the boards you later select when configuring the import. b. Choose a Kanbanize User. We suggest that you first create a dedicated user for the integration as this will be the author/user that will create that cards in Kanbanize. Note: Make sure that this user is assigned to the boards you wish to import into. c. Click on "Save" to create your sync/import account. After the Trello account is set up successfully an additional panel with a brief description of the Import feature appears. 1. Follow the "Configure Import" button. 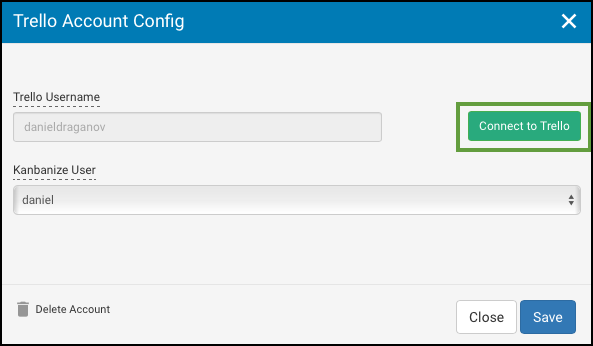 Click on it to open a modal window that loads all Trello boards from the configured Trello account. 2. Select/mark the checkboxes on the left of each board where your Trello tasks will be imported. 3. A drop-down with all Kanbanize boards will be made available to make a mapping on the right. Note: Only those boards to which the configured Kanbanize Sync User is assigned and has access to are visible. 4. Click on "Import" to start the process of fetching Trello notes and importing them into the selected Kanbanize board. When the import is finished, the user who started the import will receive a confirmation modal message that the import is completed successfully. If there is a follow-up import again over a period of time, the system will update the existing cards and will create only the new ones that were not previously imported. Note: Changed details of cards in Kanbanize will be overwritten after the delta import from its original source in Trello and if there have been deleted cards in Trello, they will not be automatically deleted in Kanbanize.